Page 5 of Brand Echo. Transcript below. 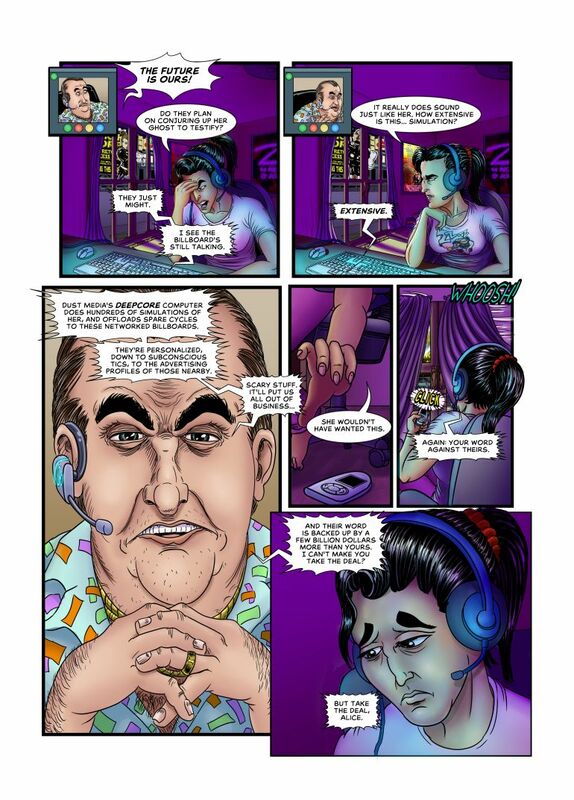 Panel 1: Alice, frustrated, at the computer, still talking to Ben. PRINCESS NEBULA: The future is ours! Alice: Do they plan on conjuring up her ghost to testify? Ben: They just might. I see the billboard’s still talking. Panel 2: Alice steals a look out the window, at the billboard. Alice: it really does sound just like her. How extensive is this… simulation? Panel 3: Close on Ben, as he talks to Alice. Ben: Dust Media’s Deepcore computer does hundreds of simulations of her, and offloads spare cycles to these networked billboards. Ben: They’re personalized, down to subconscious tics, to the advertising profiles of those nearby. Panel 4: Alice grabs for a remote on the floor. Alice: She wouldn’t have wanted this. Panel 5: Alice shuts the curtains by remote, cutting off her field of view to the billboard. Ben: Again: your word against theirs. Panel 6: Alice looking defeated, knowing that she’s backed into a corner. Ben: And their word is backed up by a few billion dollars more than yours. I can’t make you take the deal? Ben: But take the deal, Alice. Brand Echo is now on Patreon! Supporters get comics pages two days early for as little as $1!